It’s REALLY hard to get REALLY strong. And I’m going to show you in how it worked for me following a super simple weight lifting program…and how in 3 steps you can do the same. Before I show you how, let me share a quick story with you. While I was spending hours and hours training each week I just wasn’t getting consistent results. 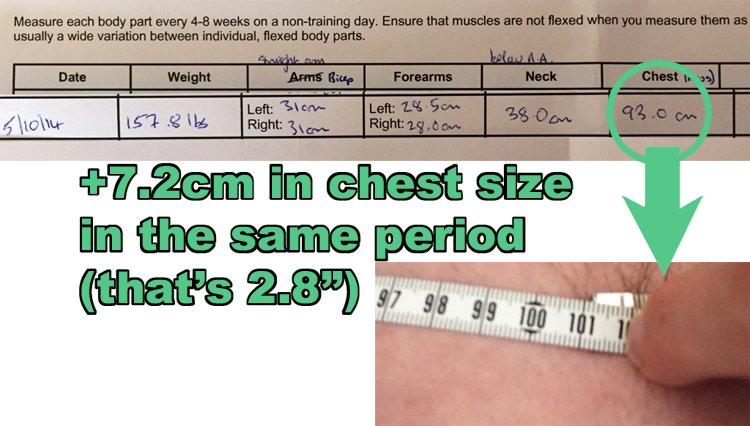 From my first workout to my eureka moment, my deadlift increased from 66kg to 99kg… A paltry 1.3kg/month increase. As you can see, the rate I was adding weight to the bar was pretty slow. I already had the old adage about “newbie gains” seared on my brain. …I even tried PAYING a personal trainer online to make me a program… TWICE! The results are INCLUDED in the above… Pretty lousy, huh? 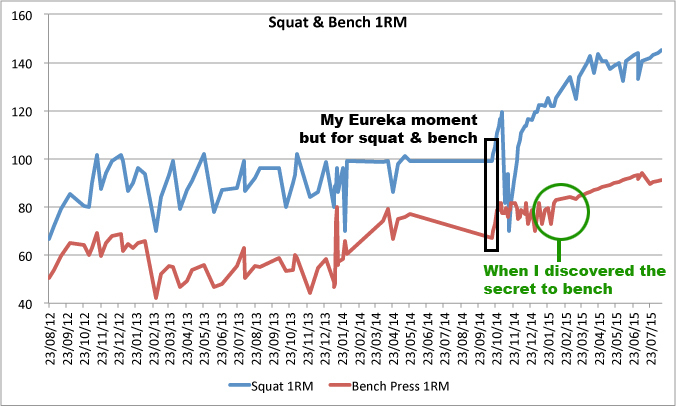 But then I had my eureka moment and I’ve added 82kg to my deadlift in less than 10 months – 8.2kg/month! How many times have you seen a personal trainer or routine online that screams: “Get ripped quick”? And another helping you to “bulk”? Another to help you “cut”? You name it, a personal training is trying to sell it. And how often do you actually see results? How often have you met anyone that has SUSTAINED their results following a weight lifting program? That’s when it hit me – I had been too distracted to make any progress. I’d been reading too many dud articles online conflicting with each other, leaping from one idea to the next. What I needed was focus. Instead of trying to get strong, lean, athletic, ripped, shredded, big arms, big neck, a 50″ vertical jump, an MBA and a kitchen sink all at once, I needed to hone in on one goal. Workout routines do not work unless they have a single, well defined goal. …and I mean very well defined! Any slack or ambiguity will throw you off track! At that point I set myself a single SMART goal – and the rest is history! To have a projected one rep maximum powerlifting total (squat/benchpress/deadlift) of 850lbs (385kg) by the end of 2015. All goals we set in life should be SMART (which is an acronym by the way). I actually stumbled across this method a few years ago at work (the 9-5), but it never occurred to me to bring it into my personal life until last year! Specific – the more specific the goal, the more likely the outcome will be exactly as we want. I could have simply set a goal to “get strong” – but how would I know when I was strong? How long do I have? Is a 50kg bicep curl strong? I needed to remove all the slack from my goal, or I would be able to cheat my way to achieving it. Measurable – I removed all doubt from my goal – I actually wrote down a cold, hard number! We need a scale to measure out achievements. As a strength trainee I wanted to focus on the weight lifted. All other stats are secondary to the weight on the bar. Achievable – Why did I go for 850lbs? Because at the time, my current total was a paltry 590lbs. Sure I would love to lift 1,000lbs one day – but I didn’t want to bite off more than I could chew. 1,000lbs seemed completely unrealistic – I would never have managed to motivate myself to keep getting under the bar knowing how far away I was from my goal. Given at the time I was 5’7″ and 160lbs, 850lbs seemed achievable – if a bit of a reach being a 50% increase! Relevant – I wanted to get strong. Setting a goal of 12% body fat would be irrelevant and go against our aim. Marathon pace? Irrelevant. Go on three holidays? Irrelevant! I honed in on the ONE thing that mattered – WEIGHT LIFTED during BIG COMPOUNDS. Timely – I needed an end point in mind to push myself towards. I focused on the end of a calendar year… Because why not have a new goal for a new year?! Set a goal. Write it down. Seriously! Why not take my goal and change the target weight & deadline? And you know what? I achieved that goal on the 11th June 2015! Six and a half months early! Here’s me deadlifting 162.5kg – that more than double my bodyweight at the time of c.79kg! Have I sat back now I’ve achieved my goal? No. Instead I am focusing on trying to reach 1,000lbs now! I’m ready at 920lbs, and increasing each and every workout. This feels so awesome, I’m now aiming to hit a figure I couldn’t have dreamed of before sticking to the same weight lifting program I love! How I Added 180lbs to My Deadlift in 10 Months Doing Less Than 20 Reps a MONTH! Yep, that’s right – less than 20 reps A MONTH! I added 180lbs in 10 months, performing only 197 reps IN TOTAL. Most trainers send people off on wild volume based routines doing 25+ deadlifts PER DAY! How much volume do we really need? Have you any idea how exhausting 25 deadlifts are? I do because I was on one of those silly weight lifting programs before my eureka moment! A deadlift is an enormous lift… The strongest compound exercise you will likely be able to perform. To do 25 of these a week is madness – your nervous system will cr*p itself quite frankly! If you did 25 deadlifts, then 4 days later another 25, then another 25 4 days after that… Eventually your body will become exhausted. Better to avoid that exhaustion in the first place than to try and dig yourself out of it. TRUST ME, I know! I’ve been there, done that. So how can you emulate my success with the deadlift? 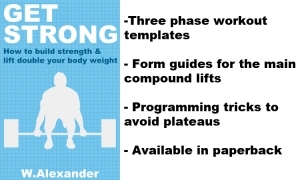 I guarantee the following 4 steps will add massive value to your workouts, adding weight to the bar and saving you hours of wasted training. I wish I had been given these FIRST! Sounds easy. And it is – until the weight ramps up! Starting height of the barbell is important to get the correct lifting position. If using less than 60kg (being an Olympic barbell & a 20kg plate on each end) you will need to prop each side up on spare plates to get it to the correct height. Think about it – we want to move a heavy barbell straight up and down. Any sideway motion is just a WASTE! 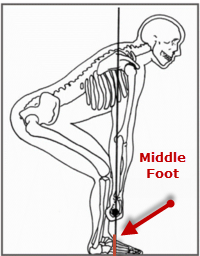 To keep our balance we need the barbell to be over the middle of our foot – otherwise it literally WILL NOT lift up! Step up the bar – set up so the bar crosses the middle of your foot as you look down. Set your heels around 8″ apart and have your toes going out at a natural 30 degree angle or so. Keep your legs straight, but bend down and take a grip on the bar just wider than shoulder width. Take a deep breath before straightening your back and raising your chest up. Look at a point straight ahead. Now we begin to lift. Squeeze the barbell up. Push your hips forward which will naturally drag the barbell up your shin and over your knee following a perfectly vertical path. As your hips are straightening you will need to straighten your back angle to keep the bar over the middle of your foot. Keep straightening until you are standing vertical. Do the reverse to lower the weight back to the start position. Exhale at the end. The barbell is always in contact with your body! Lifting weights and nutrition are interlinked. We need strength to move heavy weights, we need muscles to provide this strength and we need FOOD to grow those muscles! Remember when I set my goal I made it relevant by focusing on strength only? That’s because when I was floundering making no progress I kept getting distracted by different diet fads. I wanted to have my cake and eat it (excuse the pun!) by getting strong and losing loads of body fat. Again it comes back to my goal and focus. Now with my very clear aims, I knew I needed to eat more to support my goal. And you know what? I’ve never looked better with all the extra muscle mass! 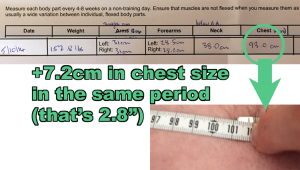 Because I was ramping the weight up so aggressively but still giving my body plenty of rest (more on this in step 3) my body was busy making loads of high quality, dense muscle tissue when I wasn’t training. Now how should we feed ourselves? We don’t want to go overboard – nobody wants to look obviously overweight. Food contains energy which is measured in calories. There are 3 components of food – protein, fat & carbohydrate. Because I want to gain weight I need to put more energy in than I take out. I was desperate to go up in weight (148lbs was way to scrawny on my frame!) So I knew I had to eat a surplus. Because my lifting was going to improve so quickly I knew I could gain weight fast and not get fat. I ate a surplus of +500cals a day! That’s a total consumption of 2400 calories each day. 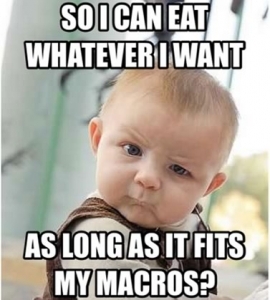 BUT we need to get a mix of macronutrients to make sure our body has the building blocks to grow! Think about Lego… You need all the right bricks to create the perfect creation. Without bogging down on the detail… We need a blend of protein (to build & repair muscle tissue), fat (to make sure our body absorbs vitamins & minerals) and carbohydrates (provide raw energy) to grow. But how many of each do you need? BUT I didn’t always eat 1204 calories of carbohydrates – as long as I hit at least 148g of protein & at least 67g of fat I ate WHATEVER I WANTED to get up to 2400 calories a day! I will be honest – my diet is pretty good anyway due to my other half and her cooking! Most of my calories come from single ingredient products – chicken breast, carrots, milk, steak, salmon, potato, etc. 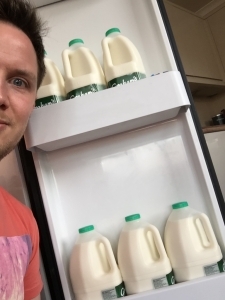 but I often struggle to eat all my calories… Those days I just drink extra milk! 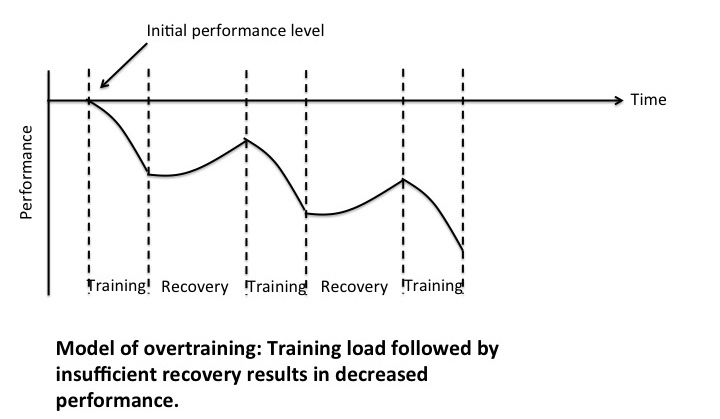 Step #3: Stop Overtraining NOW! Remember what I said about training volume? I’m doing less than 20 reps a month, where many do 25+ reps PER WORKOUT! The deadlift should be your strongest lift. It engages a massive amount of your muscles to lift through a pretty short range of motion – the perfect combination to crank up the weight. Your central nervous system (CNS) is responsible for sending messages to your muscles. It’s yelling “lift!” to your body when you’re squeezing up a deadlift. Due to the weight involved each rep puts huge pressure on your CNS. Just like a muscle, the CNS fatigues over time. And just like a muscle, it needs time to RECOVER in order to come back STRONGER. Muscles and strength are built when we rest & recover. If you do 25+ heavy deadlifts then 4 days later do the same again, your body CAN NOT recover in time to set new personal records. 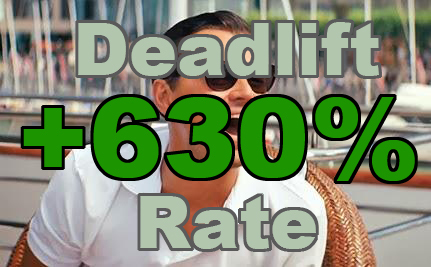 We are going to drop volume so we do only one set of deadlifts for five reps every second workout. You’re probably skeptical – how can you progress doing a measly 5 reps a week?! Well we are doing less volume, but we are adding LOTS of weight to make progress. I want you to add 5kg each time you deadlift for as long as you can! When that stops, add 2.5kg each time. I still add 2.5kg a week to my deadlift, it’s awesome!! If you do this your deadlift will rocket up! Sure doing 25+ reps might work for a while… But it will grind to a halt super quick. Dropping the volume and increasing the weight will make your deadlift shoot up like an unstoppable rocket! What About the Squat & Bench Press? I know we’ve zoomed in on my deadlift progress, but as you’ll remember from my goal squat and bench press are equally as important. You can see squat follows the same trajectory – heading upwards after my eureka moment. But the benchpress graph is a little flat initially. What caused that? And how did I get through it? I can show you that (and a lot more neat tips), too. So lots and lots of words, and lots and lots of information. But what does this mean for you? And how can you emulate my progress? I’ve compiled everything I’ve learnt into a 52 page book – if you liked what you’ve read here, you will love the book. 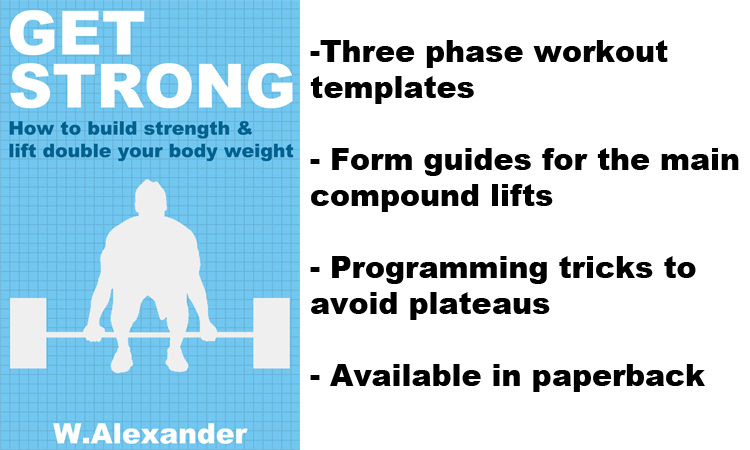 Not to mention it contains Excel templates for a 3 phase strength routine – the exact one I followed! All of this for £9.99 for the paperback… Or yours electronically TODAY for £1.99! That’s a whopping 80% discount to download RIGHT NOW! This will NOT last – get yourself a copy now to lock in this awesome sale price! And get your Excel workout templates in less than 5 minutes!